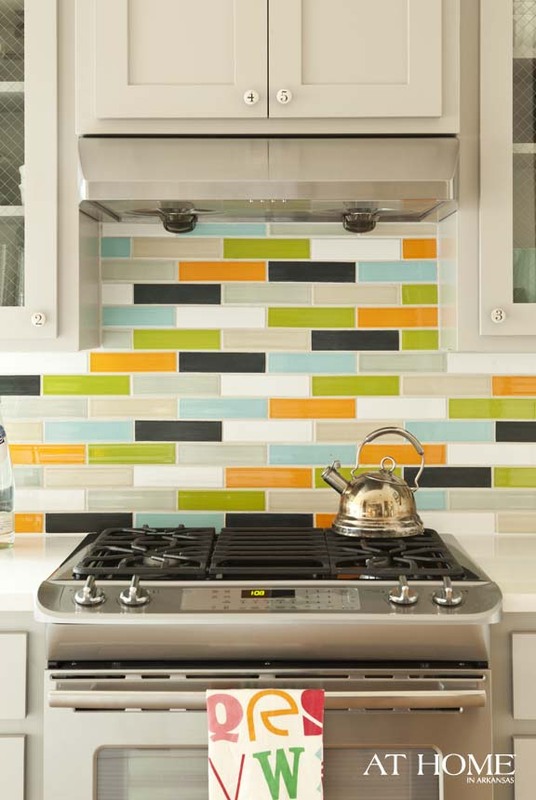 The catalyst for the entire design, Melanie says, was the backsplash, which features tile she and her husband found and personally installed. 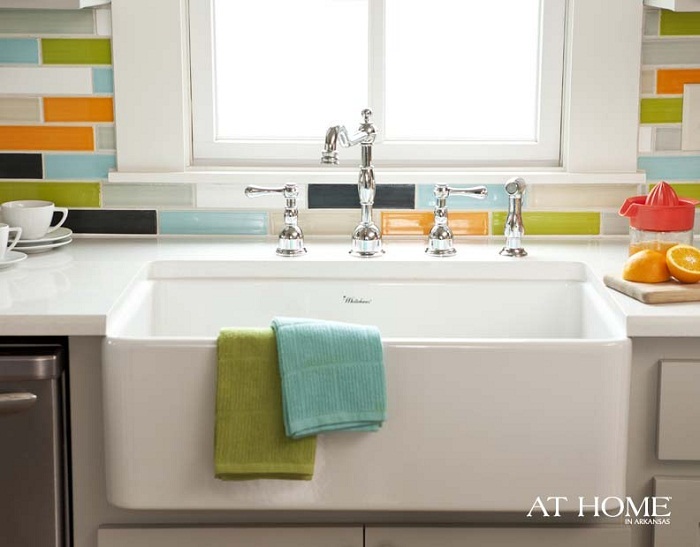 “When I saw that tile, I knew that was it,” she says. 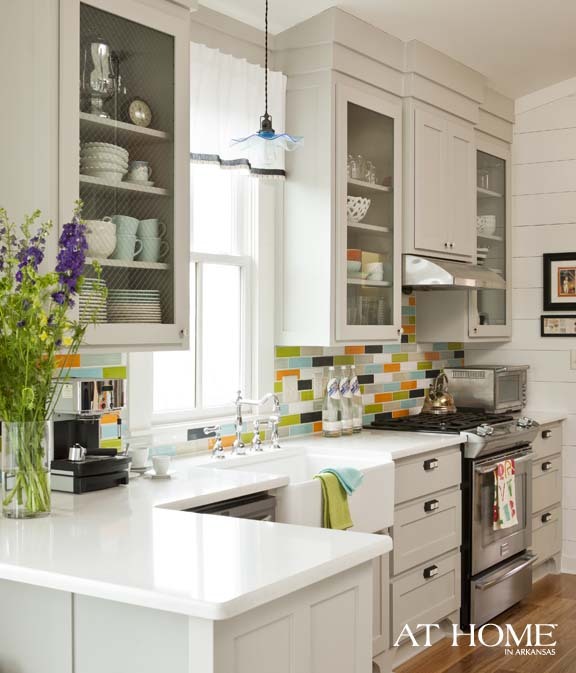 “It determined everything in the kitchen, and the colors spread throughout the house.” She chose soft gray cabinets and simple white walls to create a subtle contrast to the tile’s mix of hues, which include bright orange, aqua and green. Melanie is also fond of airy, inviting spaces, which influenced the glass cabinets and open shelving in the kitchen island. 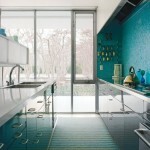 “It helps the kitchen look larger, and the glass gives it a nice sparkle,” she says. Though she first planned to use vintage glass with inset chicken wire, she discovered more affordable safety glass—something she says the glass company had never used in a kitchen. “I took a chance, and I’m so happy with it,” says Melanie. 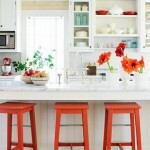 This entry was posted on Tuesday, February 5th, 2013 at 11:51 am	and is filed under Green, Grey, Kitchens, Orange, Turquoise, White. You can follow any comments to this entry through the RSS 2.0 feed. You can leave a comment, or trackback.